By reality | Also posted in Fixed Income, Government, Manias, Stocks, Strategy & Scenarios, The Fed | Comments Off on Woof! Reportedly, President Trump is considering firing Fed chair Powell, blaming him for the recent stock market declines. Of course, he then adopted the “false economy,” even though he apparently well knew that it was a bubble, going on to extend it with spending increases and tax cuts. Of course, this simply increased government’s value destruction and we will all reap the consequences. In my mind, this is the biggest disappointment of Trump’s presidency – that he knowingly continued to inflate the bubble. 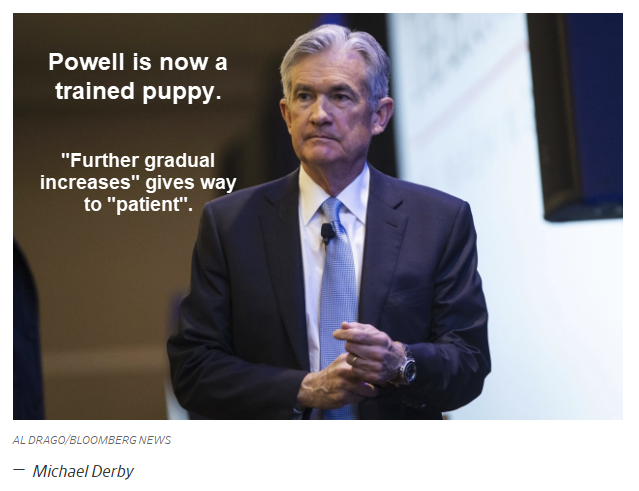 Yellen was “too short.” It seems Powell is “too tight.” Firing Powell would probably precipitate a crash. The right thing to do is to acknowledge that the Fed’s ability to control the economy is a myth. Their attempts just lead to an endless series of booms and busts, as anyone who has the least understanding of control systems theory could predict. By reality | Also posted in Economics, Fixed Income, Government, Manias, Stocks, Strategy & Scenarios, The Economy, The Fed | Comments Off on Too Tight? Close To The Event Horizon? By reality | Also posted in Debt, Economics, Fixed Income, Government, International, Lakshman Achuthan, Manias, Strategy & Scenarios, The Economy, The Fed, The Fisc | Comments Off on Close To The Event Horizon? The blockchain technology is a partial solution to the Byzantine generals problem. A full solution to the problem has been mathematically shown to be impossible. As a result, blockchain systems are vulnerable to attack by introducing enough fraudulent voting power to improperly modify the blockchain. Apparently this is now happening to some of the smaller networks. The potential prizes on the larger ones are rich enough that it is probably just a matter of time until one of them is compromised for serious money. Then we’ll see what happens. By reality | Also posted in Manias, Rogues and Rascals, Technology | Comments Off on Blockchain RIP? Another excellent piece by Matt Tabibi – The Great College Loan Swindle. The education industry as a whole is a con. In fact, since the mortgage business blew up in 2008, education and student debt is probably our reigning unexposed nation-wide scam. Making volatility easily tradeable will, IMO, turn out to have been the biggest regulatory error in history. It has long been possible to trade volatility by the use of long out-of-the-money put options, but this trading was never large and does not seem to have been pernicious. Risk and volatility are equated in the algorithmic trader’s lexicon. But risk never goes away – it can be moved around but not eliminated. Tradeable volatility is giving the illusion that this axiom is false, that risk can be eliminated with a few taps of a magic wand on the VIX futures. I don’t think so. Apparently the standoff between Governor Rauner and Speaker Madigan continues. As it should. Madigan’s willingness to dispense unfunded largesse to his supporters is largely responsible for the state’s financial woes. Today also the state was ordered by a Federal court to pay its backlog of Medicaid bills, which will be interesting as the state is already cash flow negative. These reported funding levels are a cruel joke. These funds continue to assume 7-8% returns, despite the fact that they have not achieved them for years. Just look at the column showing the decline in funding ratio from 2014 to 2015. Not only are the assumptions high, but they are for long-term averages, so that they adjust future return estimates higher to compensate for below-average realized returns. John Hussman’s work shows more or less zero returns for the next 12 years, with the high likelihood that there will be a major drawdown in that period. Drawdowns are lethal to pension funds because the payment of benefits continues, sapping the capital base and making recovery to previous levels nearly impossible. Pension funds used to invest in bonds. The trustees would meet once a quarter, review the actuarial forecast of liabilities and approve adjustment of the laddered bond portfolio’s maturities to exactly meet the liability schedule. Then there would be lunch and golf. The future returns would be locked in and the contributions needed to fund the bond portfolio would be obtained from the sponsor. Everyone got to sleep at night. Then Wall Street decided that pension funds had a lot of money, and not enough was being siphoned off into Wall Street pockets. So the sales force went out, armed with charts showing that stocks had historically offered higher returns than bonds. Higher returns mean that less contributions would be needed, so fund sponsors bought the pitch. Yes, stocks have offered higher returns but for a reason – much higher risk. Well, we’ll just assume a long-term average return and surely it will average out. GLWT. I had hoped that Donald Trump’s presidency would see some change in Washington. The attack on Syria finally dashed this hope. The neocons’ campaign to demonize Russia has shaken his confidence to the point that they are now back in charge. This is a catastrophe, for which there is no one to blame but Trump. Almost as seriously, presumably at the urging of the Goldmanites, he has not only failed to even attempt to slow the financial bubble, of which his pre-election statements show he is well aware, but has cynically relished it as proof of his success. This failure is likely to be his downfall. We are so screwed. Sauve qui peut. Well the Trump bond slaughter has not been good to the portfolio. However, the strong dollar and the rapidly falling oil price are both powerful deflationary forces. Dr. Copper spiked, but was rapidly crushed today. Foreclosure filings increased 27% MoM in October, the largest increase since the run-up to the last property crisis. All of this bodes well that, once the powers that be feel that they have achieved their goal of getting the unwashed out of bonds and into equities in time for the real slaughter, happy days will be here again. In which light, it is amazing to see that the Russell 2000, an index with an undefined PE – due to aggregate lack of positive E – is the stellar performer. This smacks of a massive degree of (emotional?) retail participation in the Trump stock rally. BTW, my target for oil is $15-20, EUR is $0.80-0.85 and CAD $0.60-0.65.